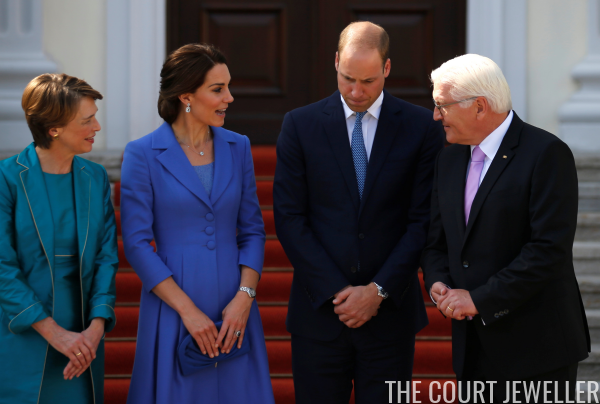 The Duke and Duchess of Cambridge moved on to the German leg of their European tour today, with a day of engagements in Berlin. 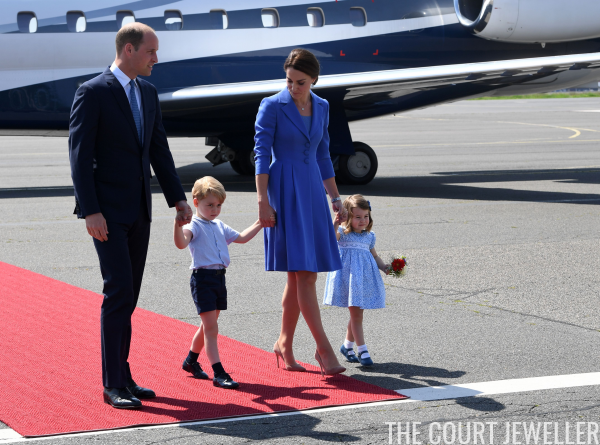 William and Kate arrived at the airport in Berlin with Prince George and Princess Charlotte in tow. 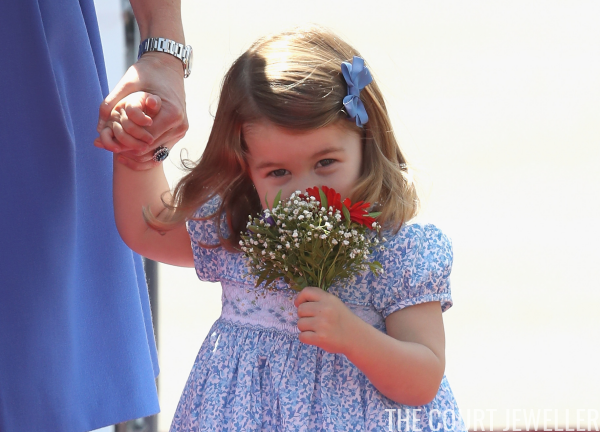 Charlotte received her very first official bouquet of flowers on the tarmac. The elder two Cambridges had a busy slate of engagements in Berlin, including meetings with Chancellor Angela Merkel, President Frank-Walter Steinmeier, and his wife, Elke Buedenbender; a visit to the city's Holocaust Memorial; a visit to a youth-focused charity; and a stop at the famous Brandenburg Gate. 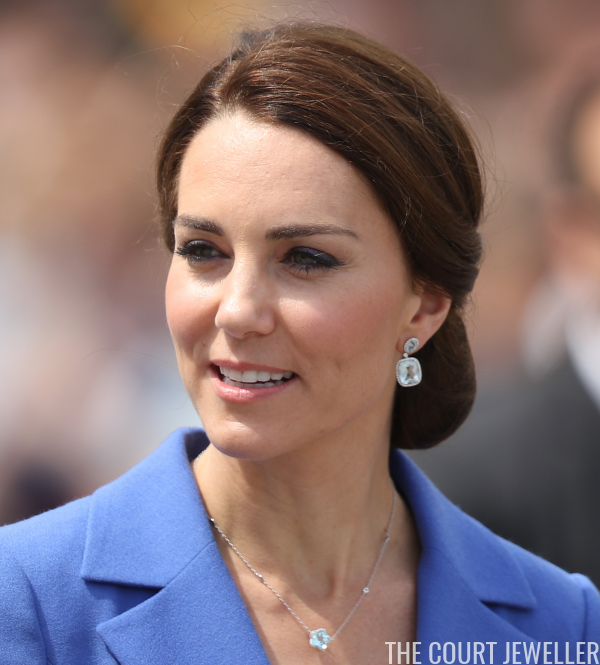 Kate debuted yet another new piece of jewelry, this time by her favorite jewelry designer, Kiki McDonough. The earrings are the brand's Blue Topaz and Diamond Drops, set in white gold. The blue topaz and diamond station necklace, which features a central blue topaz flower charm, is from the firm's Eden collection. The necklace is a new addition to her collection. She paired the blue topaz jewels with a coatdress from Catherine Walker. The vivid (and appropriate!) 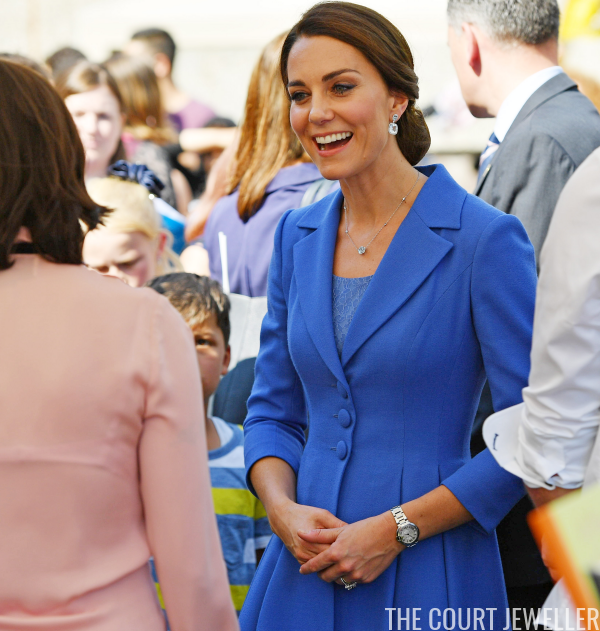 Prussian blue color helped Kate to stand out among the members of the gathered crowds.